So I am going to pick up a gun for my apartment....something along the lines of home defense. I have a friend setup who is going to show me all the basic information...being as I know almost nothing about guns and he has about 200. There have been a LOT of armed robberies in my neighborhood lately...so I want a gun that is going to make someone think twice, but is a good beginner gun...and doesn't cost a fortune. What are you looking to spend? And what kind of gun? A handgun can run about $600 and is more compact and I don't know if CO has open carry or what their gun rights are. I was thinking a handgun honestly, but I was hoping to keep it under 500 bucks. 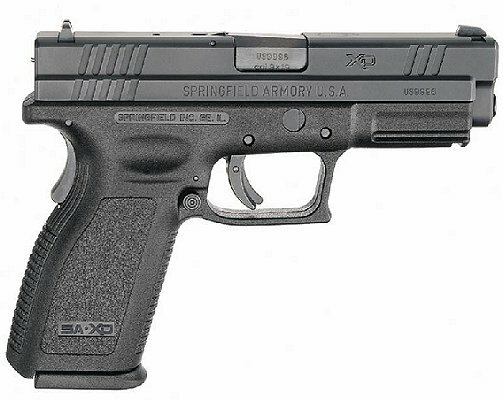 If you're looking for a handgun, I strongly recommend looking at the Springfield XD line. They generally retail in the $400-$500 range, they often come with multiple magazines (and occasionally a magazine and case), and they're incredibly reliable. I used a Springfield XD Service (4" barrel) chambered in .40S&W as my primary carry weapon for several years, and it has been my main home defense weapon since I bought it six years ago. My favorite aspect of the XD is that it's incredibly accurate right out of the box. It points very naturally for me (as opposed to Glocks) so I didn't really have to "learn" to shoot that particular weapon. XDs come in a number of chamberings (9mm to .45 ACP), barrel lengths (3" to 5"), and grip sizes (regular XD and the higher capacity XDm model), so the sky is really the limit. If you're looking primarily for a home defense weapon, I'd recommend going for the "middle of the road" across the board. The XD .40 Service (4") is small enough to be manageable, powerful enough to stop pretty much anything, and offers a high enough capacity to put down a group of bad guys. Thanks Bob. I will look into their website and see if I like what I see. The price seems to be right on the limit of what I was hoping to spend, but if its reliable and comes with some bonus bells and whistles then i will definately consider it! I think a .40 XD would be perfect for your price and what you may need it for. Just don't forget to get hollow points! So, Wes, did you ever pick up anything? I would say a shotty and a cheap handgun, two is better than one. I like to have a gun everywhere in the house, you never know where you will be when someone kicks in your door.